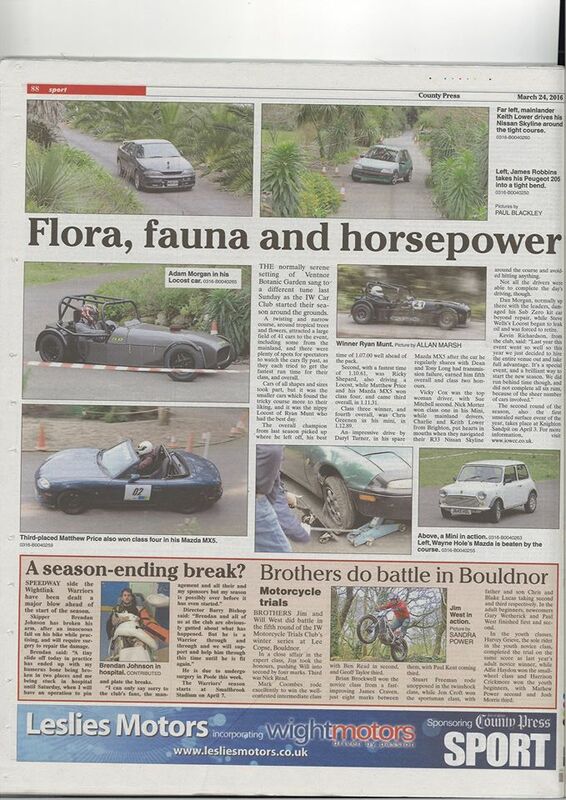 For the second year in a row the Isle of Wight Car Club competitors took over the Ventnor Botanic Garden last Sunday. For one weekend every year, the often quiet and relaxing crown jewel of Ventnor plays home to one of the most challenging and picturesque Autotest venues in Britain. History often repeats itself in motorsport, and this event was no different, with Ryan Munt scoring his second consecutive overall and class five win at this wonderful venue with a time of 67.00 seconds behind the wheel of his Locost. The former 750MC Locost Championship competitor and 2015 Isle of Wight Car Club champion only completed three runs over the course of the day, showing pace and confidence that could be tough to beat in 2016. Ricky Shepard was second overall in his Locost, over three seconds behind Ryan with a time of 70.61 seconds. Expect to see Ricky challenge for wins throughout 2016 as he learns the ins and outs of his relatively new machine. Matthew Price, the winner in Class Four, took third overall in his Mazda MX5 with an impressive time of 71.31. He was followed by Chris Greenen, who took fourth overall and Class Three honours in his Mini with a 72.89. Daryl Turner rounded out the overall top five and took Class Two honours in his spare Mazda MX5 after the car he regularly shares with Dean and Tony Long blew a differential early in the day. His time was a 73.49, an incredibly strong performance for a standard car. Nick Morter took the Class One victory in his Mini, while Vicky Cox beat Sue Mitchell to the honours for fastest lady of the day. A venue as challenging as Ventnor Botanic Garden often creates drama for even the most experienced competitors. Dan Morgan learnt this after a mistake left his Sub Zero kit car damaged beyond repair after the second run, and Steve Wells also ended his day early after his Locost began to leak oil. The team of Charlie and Kevin Lower from Brighton wowed spectators and fellow competitors by threading their R33 Nissan Skyline around the narrow course. As this event grows in prestige, we can expect more competitors from further afield to take on the unique venue. The Isle of Wight Car Club’s second round of the season, also the first Unsealed Surface event of 2016, takes place at Knighton Sandpit on the 3rd of April. To learn more, go to our events page. 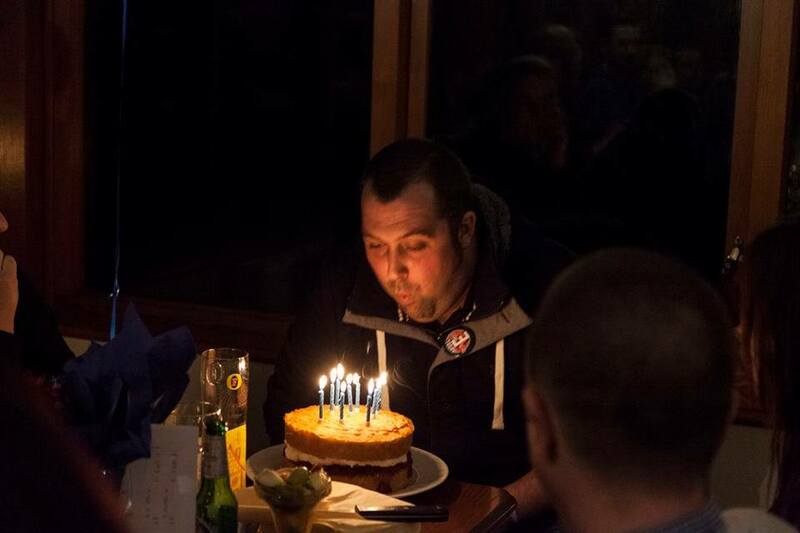 This year the car club’s annual event where club members can voice their opinion on how the club is run, the election of committee members and presentation of awards from the previous year of motor sport just happened to fall on the current sealed surface champion and overall champion Ryan Munt’s birthday. The Chequers Inn was host to the event and provided an all you can eat carvery and desert before the proceedings started. Dean Long must have been hungry or he has taken up competitive eating as his plate was stacked particularly high. The club secretary – Toby Allen took to the stage to explain to members that the club was in good form with growing membership and that we have a few plans for 2016. 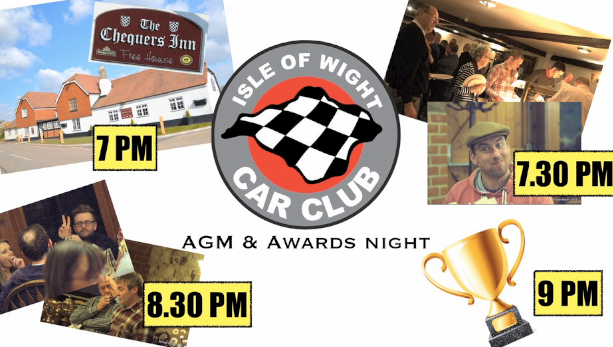 These include another joint event with the Motion Status Group (formerly IOW Stance) and that the club would like to begin an annual mainland motor sport away day where the club will introduce an opportunity to try a different type of motor sport each year, for example sprinting, drag racing, hill climbing etc. Suggestions for this year’s event are welcome. If you have any suggestions please contact the club via email. The club are also always on the look out for venues for sealed and unsealed events, again if you have any ideas for new locations please let us know. Club treasurer – Steve Wells announced that the club has made a very small profit last year, however, expenditure has been high with having to buy 4 new marshal radios totaling just over £500, 3 new crash helmets for club members to use, cones and fence spikes etc. Due to the MSA no longer allowing us to provide day membership we have had to create a new entry fee system. Membership stays at £25 per year and event fees will now be £12 if you pay in advance via pay pal on the web site or £14 if you enter on the day. This is still one of the cheapest forms of motor sport available with many other mainland clubs charging £60 – £80 entry for the same type of event. If you know anyone who would like to take part in a car club event who has never done so before, all they need is to pay their year’s membership and their first event will be free. The awards started with trophies and shields being presented to winners by club president Terry Weaver. The trophy allocation system is a little complicated but effectively there are awards for 1st, 2nd and 3rd for each class in sealed surface and unsealed surface, plus nice big trophies for sealed surface champion, unsealed surface champion and overall champion. There were a few people who were surprised to have won an award including John Cooper for 3rd place in class 2 unsealed surface and Ricky Sheppard for best up and coming driver for giving many top drivers a run for their money at the top of the leader board. Adam Morgan came home with the highest placed rookie award, James Robbins was presented with the marshals award for all the hard work and dedication he puts into the timing in the race control trailer during events and Kevin Richardson was awarded with the Ray Bell shield for his contribution to the club in the form of the video event reports. Highest placed lady of the year was presented to Jill Broomfield and Marion Brett achieved 2nd place in class 3 USS. We have a fantastic group of ladies competing at car club and the option of a ladies championship was dismissed by our female competitors in favor of more acknowledgment of their achievements. From now on you will hear a lot more about our ladies and Jill defending her title in 2016. 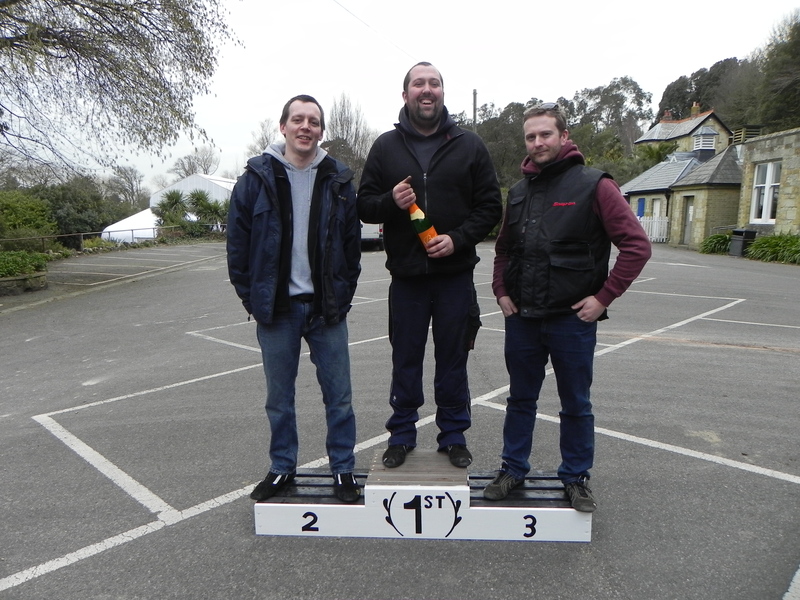 The unsealed surface champion trophy went to a well deserved Dan Morgan, who along with his brothers dominated the dirt in their Subaru. Ryan Munt’s table was already groaning under the weight of trophies and a birthday cake but he had to make even more room when he stepped up to collect the sealed surface trophy and the coveted overall champion trophy. 2nd place overall went to Dan Morgan and full respect has to go to Chris Wilson for coming 3rd overall in his class 5 special that he used in both sealed and unsealed events. 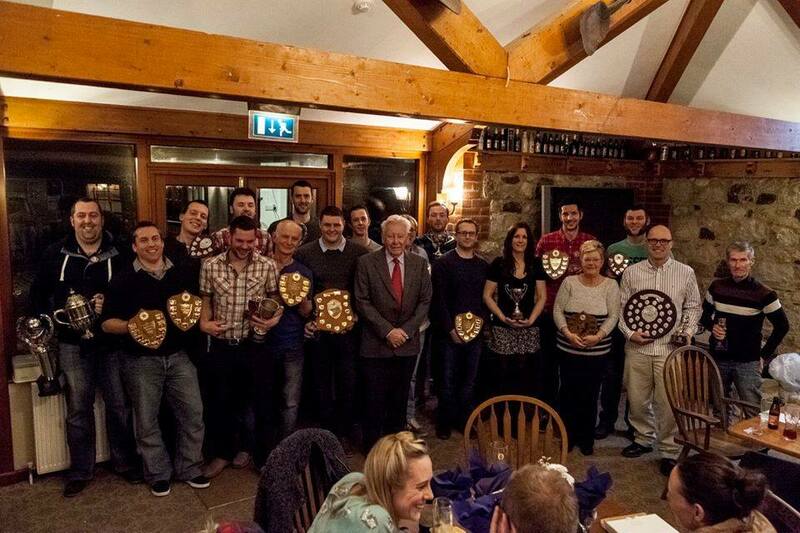 2015 event winners were presented with trophies created from the new car club grill badges mounted on wooden plinths. These badges have been faithfully recreated from the original sand cast badges available to club members back in the 1960s. If you would like one of these new grill badges for the front of your pride and joy you can purchase these for a bargain price of £10. All in all, a great evening out and a fantastic opportunity to celebrate members’ success in 2015. Lets look forward to 2016. 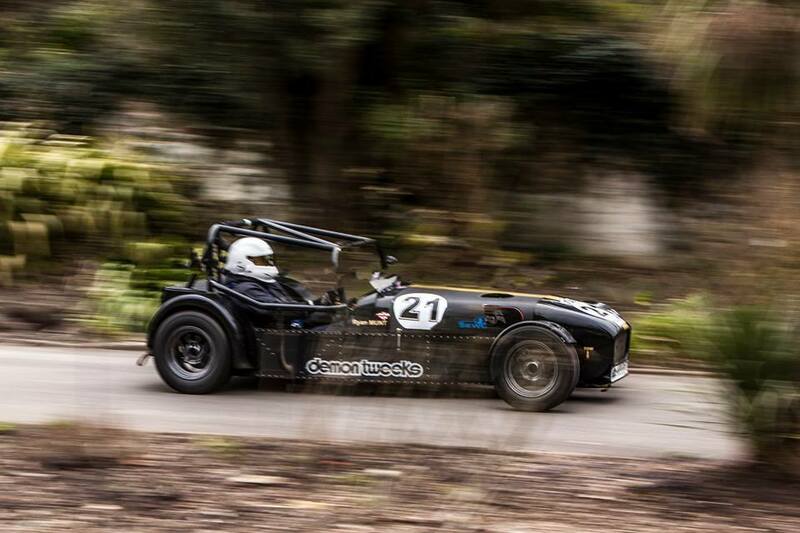 Round one of the car club’s 2016 championship will be sealed surface, held at the Ventnor Botanic Garden on the 20th of March. This was the highlight of 2015 and this year the garden are opening up the grounds for free, so that spectators can enjoy a day’s motor sport within the beautiful gardens. All they ask in return is a donation to help maintain their amazing collection of plants and trees. Thank you to Allan Marsh for his images and continuous commitment. This Saturday – 5th of March – the AGM and Awards night at the Chequers Inn! Book your meal in advance using PayPal below. Arrive at 7pm to eat or you can come at 8:30pm just for the AGM and awards – see you there!